8point3 Energy Partners, National Grid, and Enterprise Products Partners haven't been market darlings, but that is why investors should take a look. Just because the broader markets are hitting all-time highs doesn't mean that every stock out there is doing great. There are quite a few companies that have fallen a bit out of favor with the markets. For investors who are looking for dividend-paying stocks, this can be an opportune time to buy strong but unpopular dividend-paying stocks at decent prices. Three of those companies -- 8point3 Energy Partners (NASDAQ:CAFD), National Grid (NYSE:NGG), and Enterprise Products Partners (NYSE:EPD) -- look especially compelling today. Here's a quick look at each and why investors shouldn't worry too much about the market throwing some shade on these stocks. 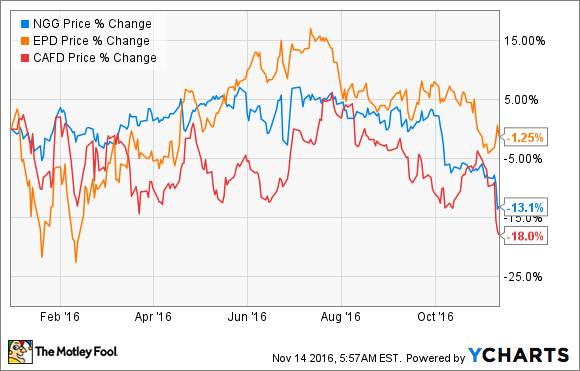 Solar stocks have taken it on the chin in recent months, and it isn't solely because of the recent election results. Many companies wanted to install solar before they assumed the investment tax credits expired at the end of 2016. Those credits were extended, but many investors had already planned for them to expire and didn't line up much work for solar businesses in the coming years. This, plus the challenges of finding financing for solar deals, has spelled a tough year for shares of 8point3 Energy Partners. One thing that separates 8point3 from other solar companies is that this yieldco isn't in the business of selling solar panels; it owns utility-scale projects that sell electricity on long-term contracts. Many of the tax benefits for those solar installations have already been monetized by the parent company, and so there isn't as much risk for the company's current business if the tax credits were to disappear under a new administration in Washington. For 8point3, growth may be a bit constrained as its parent companies -- SunPower and First Solar -- might not be able to receive financing deals as attractive as it used to now that those incentive tax credits are gone. However, as 8point3 stands today, it has a 6.3% yield that is covered with its cash flows, a reasonable debt load, and strong contract coverage with low counterparty default risk on its owned solar facilities. It has the legs to get by on its current assets, and doesn't require constant equity and debt injections to keep running. If the company can make it through this lull in solar development, then shares of 8point3 could be pretty attractive over the long run. There are few businesses that are more stable than electricity and gas distribution. The business of being the middleman in the movement of electric power and natural gas is highly regulated. That means that players in the field may not have huge growth attached to them, but can rely on steady revenue from regulated rates and fixed rates of return. This is what makes National Grid such an interesting investment: All of its assets are in either electricity or gas transmission and distribution in the U.K. and U.S., and the billions it invests in infrastructure improvements or expanded service guarantee a certain rate of return on equity. One point of uncertainty with National Grid today is its plan to sell a large stake of its U.K. gas distribution business in early 2017. The goal of this sale is to return a large chunk of cash to shareholders, while also freeing up some of its capital expenditure budget to focus on its U.S. operations that have greater growth opportunities. This, and large currency fluctuations between the U.S. dollar and the British pound, has weighed on the stock. Still, the company's assets in place will continue to generate decent rates of return, and the company's annual dividend payments for 2016 put its yield at around 4.6%. For someone looking for a stable income-generating stock backed by high-quality assets, National Grid is hard to beat. Lately it seems that no matter what Enterprise Products Partners does, investors just can't quite warm up to the company. Even though the company has consistently shown the ability to withstand the downturn in the oil and gas industry quite well and has maintained its pace of consecutive quarterly distribution increases, shares have been basically flat for over three years. One thing that makes Enterprise unique in the pipeline and midstream business is that it has built a diversified system. When one part of the business may be weak, such as total volume of natural gas in the system, the company can cover for those shortfalls by doing more natural gas processing, or exporting certain products, like propane. That system diversity has been one of the key factors that has allowed the company to maintain strong levels of cash flow instead of having to rely as heavily on outside capital as others have during this downturn. When oil and gas activity in the U.S. picks back up again, Enterprise will most likely see a positive impact on its results and likely boost distributions even higher than today. At a distribution yield of 6.4%, Enterprise Products Partners shares look pretty tempting for those looking for a stable income investment.